Online Darshan, a treasure house of information on religion and spirituality has been launched to bridge the gap between the divine and humanity. User-friendly links from each page ensure easier access to any section from anywhere. For the first time on the net, detailed information on all the Temples of India is made available with a search facility by the name of the Deity or State. Devotional songs, Bhajans and aartis, Travel tips with Maps of each city, Travel routes and Travel assistance is also provided for the convenience of Pilgrims. Exhaustive websites of holy shrines of Vaishno Devi, Sri Balaji temple, and Mathura Vrindavan, are the highlights of this section. We also have a special aarti room where you can perform Cyber Aarti of your favorite deity. The pooja room has the idol of the deity & a pooja thaal. The lighted lamps (divas) and basket of flowers are provided to you to perform the aarti. Hindus all over worship more than 33 million Gods and Goddesses, each god has many names, according to the place of worship and the narrative attached to them. Krishna is worshipped as Balaji in south and as Lord Jagannath in Orissa. The section on Gods & Goddesses will elaborate their significance and also detail mythological stories attached to them. Online Darshan also has a section on Religions of India, which takes you through the various religions in India, their significance and the practices associated with them. The mystique finally unfolds, giving a clear insight into practices significance and teachings of all the religions. The Photo Gallery has an anthology of invaluable photographs of gods & goddesses, collected from different arts of the country. You can view, download or print these and can use them as wallpaper on your computer too. Gita is the great epic of wisdom narrated by the divine lord Krishna to his disciple Arjun in the battlefield. 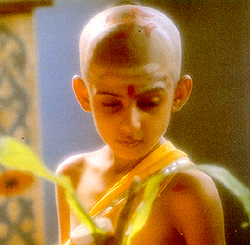 Gita describes activities of the person at peace. A symphony of soul's longing for divinity, search for clarity and what constitutes the divine union, and how one gets there. Online Gita for the first time in the World, has all chapters explained shlok by shlok with a running audio in hindi. Online Ramayana is also narrated shlok by shlok with the audio and the explanations. Ramayana is the story of RAMA the idol of virtuousness, an ideal son, ideal husband, ideal king and above all an ideal and compassionate human being. One of the most important literary and religious text of south Asia, Ramayana can be enjoyed on-line in text and audio format.